Leica has revealed the latest incarnation of what it claims is the world's smallest full-frame digital system camera, the Leica M9-P. Announced in Paris at a gathering of Magnum photographers, the Leica M9-P offers the same specifications as its sibling, the Leica M9, offering an 18-megapixel, 24x36mm sensor (35mm format) in a compact design. The new Leica camera will sit alongside the M9 in Leica's rangefinder portfolio and is aimed at professional photographers. New features on the Leica M9-P include a a scratch-resistant, sapphire crystal covering on the LCD screen that is resistant to wear and virtually unbreakable, Leica claims. Available in silver chrome or black, the Leica M9-P UK price tag, including VAT, is £5,395. 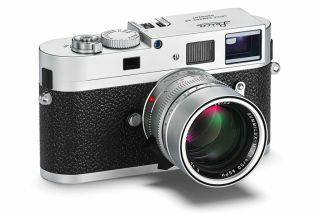 Leica says the the M9-P will be available in the UK from June 2011.